The Satellite Hunters of K.G.S. This was due to the activities of the science teacher, Geoff Perry, who, with the help of antiquated equipment and a team of enthusiastic pupils, managed to unlock the secrets of the Soviet Russian space programme even before the Americans. Extraordinarily, this was not the only time he achieved such a feat. 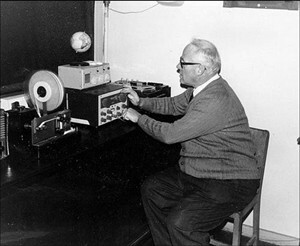 From the early 1960's, Perry had realised that by studying the Doppler Effect - marked by a change in the signal as the spacecraft passed overhead - he could discover the orbit of the Soviet Cosmos satellites. This page was added by Chris Leuchars on 06/03/2008. I was a pupil at a Birmingham Grammar School in the late 1960s and I vividly recall reading in New Scientist about the satellite monitoring going on at Kettering Grammar School. I had Geoff Perry as my Physics teacher when I was at the Boys School. What a brilliant bloke he was. I was was a pupil of the Tracking Group 1966-1971 and still maintain an interest in satellite tracking. I believe I am the only former pupil to do so. I had Geoff Perry as my physics teacher in the late 1950s and he inspired a reluctant student to achieve a GCE in Physics. Later, as a police officer, I met him directing traffic when I arrived at the scene of a road traffic accident to be greeted with, 'Hello, young Hopkins, how long should I do this?' A truly inspiring and modest man. I had Geoff as my physics teacher while I was at KGS (and also worked for him as a lab steward during my 6th form years). He was a great shot with a blackboard cleaner. As he said, "if you were paying attention then you would have seen it coming". I was part of Mr Perry's satellite tracking team and tracked a Rohini satellite. He was a character and a very inspiring teacher. I was present when the TV crews came in to interview Mr Perry. It was a great school but was left to ruin, a shame! Here's to the teachers of the future. I was a member on the Satellite Tracking Group from 1979 to 1983. During that time the group were interviewed by numerous newspapers and international television crews, including from Switzerland, Japan, the USA and the UK. We also watched Russian satellites alter position to provide 24 hour coverage of the Faulklands Islands in 1982. I was lucky enought to have Geoff Perry as my Physic teacher in the early 1970's. In addition to being a great Physic Teacher he was indirectly, a great Maths teacher. I cannot forget being amazed at his ability to do complex multiplication and long division on the blackboard, whilst looking at the class. Geoff Perry was my Physics teacher and I remember him showing me an xray machine that he had made and seeing the bones in my hand!! I became a radiographer 5 years later! !